Designer Patis Tesoro (center with glasses) poses with her models and choreographer Ogee Atos (right) at the annual fashion show fundraiser of the Philippine International Aid (PIA) in San Francisco, November 2012. The Philippines’ hottest designer Patis Tesoro scorched the runway with the unveiling of her latest collection at Philippine International Aid’s (PIA) annual fundraiser at the Hyatt Regency Embarcadero in downtown San Francisco last November 18. The audience of about 750 of the Filipino American community’s well-heeled gaped in awe as male, female and child models strutted out in outfits that defied traditional labels. Malongs that really weren’t malongs, tops that weren’t the usual tops, sheer piña (pineapple fabric) kimono-inspired vests and blouses, scarves, harem pants, midi- and miniskirts–each one in mesmerizing colors–chartreuse, orange, red, fuschia among them—were matched with swirls, circles, dashes, plaids and tongues of fire that shouted bold, funky and edgy in every way. Unique and daring, many of the outfits were unimaginable outside the runway. But if anyone actually dared wear them on the street, San Francisco would probably be the best city to showcase the fashion statement; but that poor soul would have to cover up with a coat. Not for temperate climates the collection was. Patis Tesoro is best known for her passion and dedication to Philippine traditional textiles and weaving. Her native costume creations are admired for their meticulous embroidery (calado) and appliques. This was what the audience expected and it was what they got, but with a twist. Yes, Patis’ genius for the innovative use of piña was in full display, but hardly anyone (or at least those who were uninitiated to the world and the vocabulary of high fashion) expected that these traditional hand-woven textiles could be dyed, shaped and combined with other textures beyond a saya (traditional skirt) or a barong tagalog (traditional men’s shirt). The fashion show, which lasted 40 minutes, was a feast for the eyes, a fitting highlight to PIA’s 26th anniversary fundraiser, which benefits more than 2,000 indigent Filipino children annually. The kids are now able to go to school because of the generosity of the Bay Area Filipino community. Yellow gold gown with multicolored appliques on shawl collar and yellow green passementeries or cording on skirt. A Patis Tesoro creation at the annual fashion show fund raiser of the Philippine International Aid (PIA) in San Francisco, November 2012. Multilayered ensemble consisting of sheer vest, lavender and purple top, pink miniskirt with lime and peach sash, violet leggings. A multicolored floral hat completes the ensemble. A Patis Tesoro creation at the annual fashion show fundraiser of the Philippine International Aid (PIA) in San Francisco, November 2012. Blue bustier with fuschia, light blue and orange embellishment, and black tulle skirt with white ruffles and matching hat. 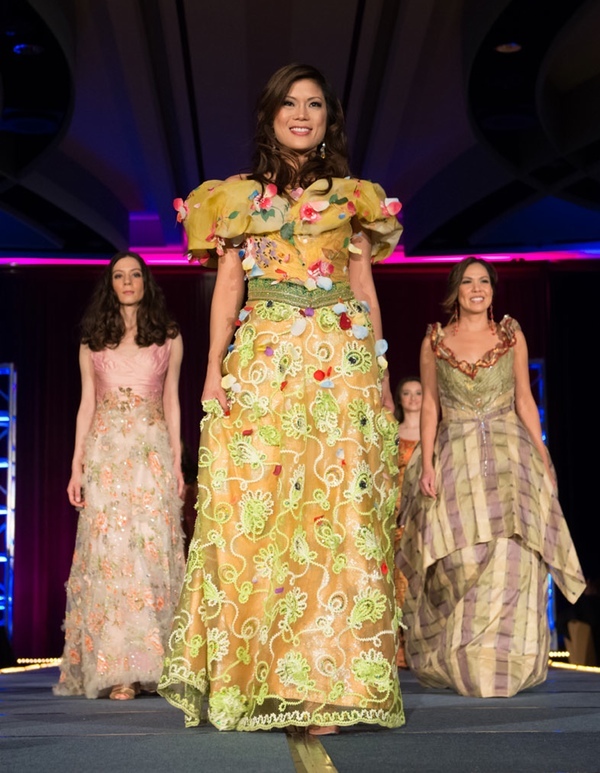 A Patis Tesoro creation at the annual fashion show fundraiser of the Philippine International Aid (PIA) in San Francisco, November 2012. Yellow gown with greenish and red trimmings on bodice and sleeves. 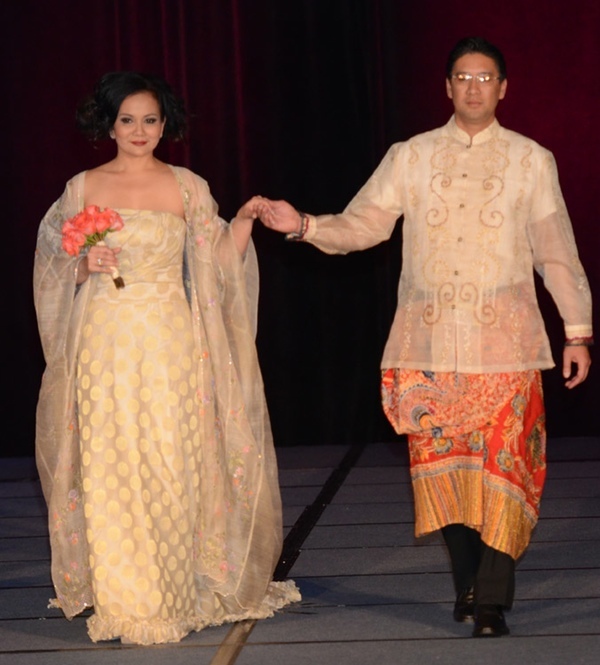 A Patis Tesoro creation at the annual fashion show fundraiser of the Philippine International Aid (PIA) in San Francisco, November 2012. Hip-length kaftan with hand painting and horizontal stripes over an A-line midi-length skirt with ethnic multicolored panels and vertical black ethnic stripes. A Patis Tesoro creation at the annual fashion show fundraiser of the Philippine International Aid (PIA) in San Francisco, November 2012. Gold sheer waist-length kaftan over yellow harem pants with large strawberry prints. A red and white plaid scarf completes the ensemble. A Patis Tesoro creation at the annual fashion show fund raiser of the Philippine International Aid (PIA) in San Francisco, November 2012. Sheer tunic with three-quarter length sleeves with ethnic inlay and a multicolored midi-length skirt. A Patis Tesoro creation at the annual fashion show fundraiser of the Philippine International Aid (PIA) in San Francisco, November 2012. Ecru damask strapless wedding gown with a floor-length piña kaftan embellished with multicolored pastel embroidery. The male model wears an ecru embroidered barong over an orange and gold malong and black pants. A Patis Tesoro creation at the annual fashion show fundraiser of the Philippine International Aid (PIA) in San Francisco, November 2012. Fashion designer Anthony Legarda consulted for this article.